May 25, 2018 marks the day the GDPR will be enforced, but a lot of businesses are finding themselves totally unprepared. If you’re one of the businesses that’s not exactly sure what the GDPR is, here is an explanation of its expectations and three things your business should do now to be GDPR compliant. The European Union General Data Protection (GDPR) is a new set of regulations that are designed to protect the data security and privacy of citizens. The enforcement of the regulation will apply to any business or company that does commerce with European Union citizens no matter the location of the business. So far, it appears that 60% of businesses that have been polled won’t be ready for the deadline. The fines and penalties that will come from being noncompliant in the aftermath of a security breach will be staggering. Aside from this, many businesses are still unsure of what it means to be GDPR compliant. There are always exceptions, but at least every business that collects personal data from users, clients, and vendors, is likely to experience a security breach in which data is exposed, compromised, or stolen. It is unfortunate, but this is an inevitable fact and one of the costs of doing business in our modern world. Now, you may be asking yourself how the GDPR can expect businesses to predict and avoid security threats altogether. The answer is that it can’t. The GDPR doesn’t expect businesses to patch security threats that can’t be predicted and to avoid security breaches completely. The GDPR does require that businesses make every effort possible to mitigate the damage security breaches have on people. It is important that you start taking steps now to lessen security threats, prevent security breaches, and mitigate risks when prevention doesn’t work. If you make enough effort ahead of time to avoid security threats and one does occur, documentation of that effort could be enough to establish GDPR compliance, which could help you avoid fines and penalties after a breach occurs. Here are three things your business can do to prepare for the GDPR compliance deadline of May 25, 2018. Every member of your staff, manager, supervisor, and executive alike should be educated on what the GDPR is and why it is critical to maintain compliance. Each member of your team needs to recognize that under the GDPR, personal data is the most precious asset your business owns. This information should be handled with care always. Hold training sessions so you can explain the details of the GDPR to every person on your staff. Every employee has a role in protecting data throughout the organization regardless of their level of access. A lot of businesses fail to recognize what kind of personal data they’re collecting and processing. The GDPR demands that you know what data you’re collecting, why it’s being collected, how it’s processed, and who’s processing it. If the GDPR isn’t satisfied with your level of data assessment, they could perform a full information audit. Just like you would create a fire drill or severe weather plan, your business should have a plan for a security breach in place. Once the GDPR is enforced, your business needs to have a comprehensive plan lined out for when personal data is exposed, compromised, or stolen due to a security breach. Each business needs to have intrusion detection and an incident response policy to reduce damage caused by a breach. As a small business in Cedar Rapids, Iowa, it may seem like you don’t have to worry about security breaches, but that doesn’t mean that your business isn’t vulnerable. 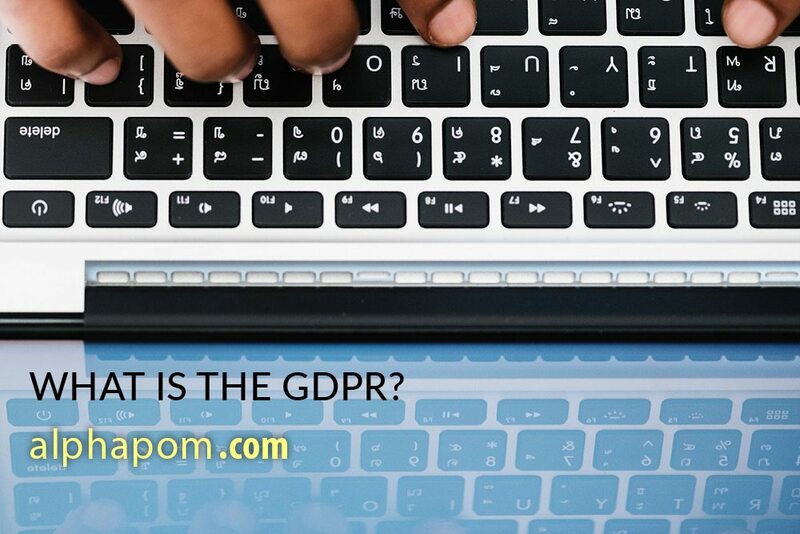 Should you have questions about your business’s GDPR compliance, speak to the digital marketing team at Alphapom today. We specialize in SEO, social media management, website creation, blogging, and more.